This looks really good. I love French toast. This looks absolutely delish! Thanks for sharing. You can’t miss with these yummy ingredients. 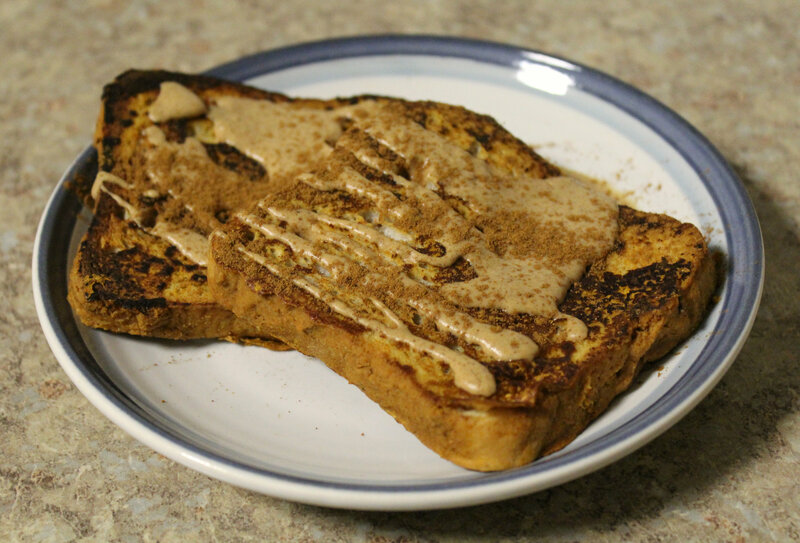 I am so delighted that you shared your healthy and delicious Peanut Pumpkin French Toast recipe. This recipe is on my must-make list! It’s a tough call between waffles and french toast for me! This recipe sounds amazing! Haha, well I’m still a pancakes girl through and through! Now this is a terrific spin on French toast! Pinned this because I can’t wait to make it! Yum. I love all things pumpkin + french toast, yum! This looks and sounds so good! I love anything that has peanuts in and I can imagine how well it goes with the pumpkin. Yes! Nice and “buttery” without any butter, haha! This looks absolutely delicious! My mouth is watering just thinking about it. Then you have your weekend breakfast plans all set! It’s one of the best alternative flours to have on hand! Wow this is a different combination for french toast, although I am seeing a lot of new recipes. French toast should never be boring. Haha, you’re so right about the 3 types of people! I am a french toast person 🙂 I will definitely have to give these a try sometime! Well I’m glad you’ll be trying it 😉 Pancakes will always be my number 1! Summer may be right around the corner, but I’m already ready for pumpkin everything. This french toast sounds so good! Pumpkin 365 😉 It’s never a wrong time! Oh wow! This looks incredible! I would never have though to toss pumpkin in with a french toast flavour but I can see how they would go together. You’re so creative! It works in all the yummy ways we need 😉 Thanks Cristina! Heck yea! This is where the flavors should be at! I love French toast and this combination of flavors is amazing! I love everything that’s pumpkin flavored! This looks great! Pumpkin and peanut butter are a favorite combination in our house! My little ones love it in muffin form, pancakes, you name it… so I’m pretty excited to try this French toast on them – know it will be a hit! Sounds very cool. Toast in pumpkin flavor makes very interesting! I have a feeling you’ve never had French Tost, eh? I love french toast and have it two mornings a week. Your recipe is ingenious I can almost taste it. I will have to try that one. Fantastic! This is one to try then! I love french toast and I love pumpkin but have never had them together. It sounds delicious! And that peanut sauce……yum! They were meant to be paired together! Do you think the peanut flour could be swapped for chickpea flour without disastrous consequences? That would give you plain old pumpkin French toast. We eat a lot of french toast in our house on Sunday mornings. Will have to try your version. Anything pumpkin is always good! I hope you do! Enjoy! Im a waffle kind of girl but they were always a rare treat. Typically my Sat am breakfast would be cream of wheat or grits while growing up. Although, i would havw enjoyed your French toast! Haha! That’s kind of terrible! Weekends are for the fun breakfasts! This puts a whole new zing to French toast. Sounds delicious – what wonderful breakfast this would make. Pinned & Tweeted! Peanut, pumpkin and french toast! 3 of my favourite things in one 🙂 Looks amazing. I love pumpkin all year long! I try to snag up all the discount cans of organic pumpkin every year after Thanksgiving. Thanks for giving me the perfect breakfast for tomorrow. Haha, yes! I feel like my pantry is naked without a few cans on hand all year! Love the idea of combining peanut butter and pumpkin! 🙂 Yum!! Yum, Yum, and Yum!! I haven’t had French toast in years because of the eggs – now I can!!! You know, I think I might actually be a French Toast girl. Although, I almost never make it and I don’t know why. I’m sure my kids would love it. It’s something I always used to get in a restaurant though…especially when I was pregnant…and the sweeter, the better. 🙂 I have had French Toast on the brain lately because I was thinking of Mother’s Day brunch items and that would be a good one! Anyway, peanut and pumpkin sounds like a delightful match! I have never worked with peanut flour, but I guess I need to get some! O girl, I think someone needs to make you some French Toast breakfast in bed on Mother’s Day (hint hint to the fam!) Haha! French toast does get so forgotten, but it really is good! Ah yea! French toast all the ways! This looks so Ah-maz-ing! I love pumpkin and peanut flavor. Om nom nom. I didn’t think you could make french toast without eggs, so this is pretty awesome. I’ll have to try this out. Drizzle peanut butter and cinnamon on top. YUM. You can never love them too much 😉 Eggs are like the bane of my existence. I hate everything about them and the cruelty that comes with them. So I am determined to make everything that people normal eat with eggs…vegan! Peanut flour is great, right? :) My dogs love it stirred in oatmeal:) Cute recipe! Your dogs have good taste! This looks delicious! Would it work without the stevia? As I’m currently on a sugar detox. Of course! You don’t have to use any sweetener! Holy crap. French toast is my favorite, pumpkin is my favorite, peanut butter is my favorite. This just blew my mind. I need this in my life, like now. Bookmarking this one for sure! Haha! Thanks Courtney! You will definitely love it then! I love French toast; although, for some reason I rarely make it. I definitely need to get into doing that again. I love everything about this one and I love the fact that it’s single serve! Yea, it is one food I always forget about too! And single serve is the way to go!